I think that we already pretty well know this, but the evidence has always been circumstantial. Now we have and are tracking the biological pathways and confirming the processes. The real take home is one that I have lived my entire life. Leave it at the office and operate a disciplined life that provides plenty of me time for personal pursuits such as reading in my case. Learn to compartmentalize. That is sometimes difficult but it allows problems to be set aside for the nonce. Stress needs to be handled in pulses, allowing mind and body to fully recover in between. The important lesson however is that you have a lot of control over this. (NaturalNews) We've all heard the jokes about stress turning our hair grey, and everyone understands that stress feels uncomfortable and can cause short term health and psychological issues. However, there was never any conclusive proof that chronic stress could actually shorten your life span by accelerating the aging process until recently. When our immune system is compromised, it's easy to catch every little virus that comes along. It also makes it harder for our bodies to fight off disease and cancer since our immune cells are our front line defense against all things unhealthy. 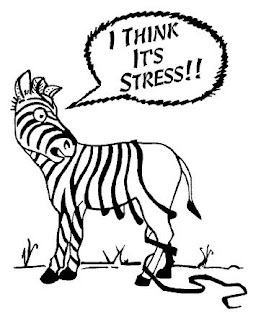 How you manage stress can be a huge benefit and may impact how your DNA reacts to chronic, high stress. Exercise has shown enormous benefits in the biometric readings that are associated with stress; such as blood pressure, heart rate and levels of harmful "stress hormones." Exercise and movement help you to blow off the steam that builds from pressures on the job, in your personal life, financial stress and other common stressors. Managed breathing can also help to bring down the biological responses that occur with psychological stress. Visualization and meditation can also produce visible, favorable changes in your body's stress response. If you can manage the biological responses that occur, then you can minimize the damage done to the DNA and add some precious (stress free) years to your life here on earth.